We aren’t suggesting you go digging through the trash looking for empty cans, but if you’ve already got some empty cans in the privacy of your own home, you could certainly do worse than turning them into unique enclosures for your electronics projects. Better than sitting in the landfill, surely. This hack from [Robin Hartley] turns an empty Cadbury hot chocolate can into a portable speaker that’s sure to get some attention. But don’t be fooled: a surprisingly amount of engineering went into this project in the form of a 3D printed structure on the inside of the can. Even if you aren’t big on the idea of putting your next project into a piece of literal trash, there’s something to be said for how professionally everything fits together in this build. The key to this build is the 3D printed “skeleton” that holds the speaker and circuit board in place. An especially nice touch is how [Robin] designed the mount for the speaker: as it had no flange to attach to, he made a two piece clamp that screws together around the rear of the speaker and holds it in place. 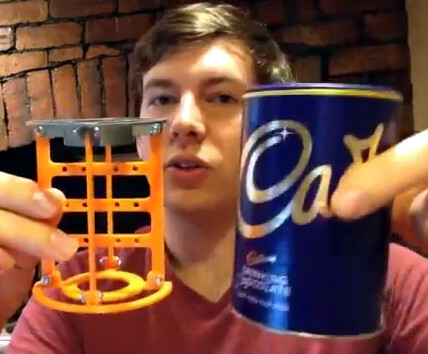 You may wonder why somebody who’s clearly as well versed in CAD and 3D printing as [Robin] is might want to use an empty can as an enclosure; surely he could just design and print a case? Undoubtedly. But the goal here is to reuse what would otherwise be trash, and that occasionally means taking the “scenic” route as it were. To take this concept to the next level, check out the upcycled speaker box we recently covered. We’ve seen some gorgeous home audio builds that started as a curbside find, but depending on how lucky you are, it’s almost like cheating. Portable speakers should be allowed to individuals after mandatory audio personal space training. Remember kids on the subway or in parks with big ol’ boom boxes that looked like chrome and silver cinderblocks blasting that original hip hop? I kinda miss that actually. Hey! I resent these insinuations about people who dig through dumpsters. There is a fine tradition among hackers for this sort of thing, even on Hackaday. But if I need a can, I will usually buy it full of product which I consume, then have a can of known history and pedigree. Pretty sure he was referring to people that dumpster dive for cans to return for money and not regular dumpster divers. And they are on the other side of the pile, collecting cans, while I dig DOEs and neat electronics off the other side. I’m not looking for things to sell, but I’ve found things worth many a large bag of cans at 5cent deposit. I’m really tempted to make a ‘bottom of the barrel’ joke here. (Un? )fortunately, I CANnot for the life of me come up with a good one. Well, since it held a non-solid, he didn’t have to scrape the bottom…. I had some stock car stereo, parcel shelf, takeout cones I got given for free, mounted into a couple of coffee cans over a decade ago, they actually sounded pretty good. I’ll pass on cutting my fingers all to hell. Pringles chips has had promotions for where you could send in for speakers to convert a pair of their (presumably empty) cans into a portable speaker set. Apparently this went around again as a Bluetooth promotion in some markets in 2017. Taking that pair physically-smashed-but-acoustically-operable pair of headphones apart and doing the same would save you the 8 – 12 week wait. I wonder if they took advantage of the waveguide properties of the can (even if far less than optimal) to boost the Bluetooth range. Elementary Electronics had a classic variant on this in the early seventies. Take a can of Planters peanuts or cashews, empty it, then cut a hole in the plastic lid, slightly smaller than the speaker. Glue the rim of the speaker to the lid. Not hifi, but a utility speaker, and the driver is protected. Space volumes (cans) are regularly used to isolate midrange or tweeters from the bass inside a full range enclosure. This can has a resonance nowhere near bass. It will exhibit the coffee cup effect though. Radio plays using the “scene” of a conversation on the phone frequently used a cup held close to mouth and mic for that telephone sound for the person on the other end of the “line”. Garrison Keillor did it on PHC. I can usually tell the size of one of those blurtooth noiz makers in someone’s backpack going by on a bicycle blasting the sound out for their behind then rather than in their face. I can determine this by their resonance, they’re a one note organ pipe-ocarina with an acoustic suspension 3 inch woofer stuffed inside. Once the volume is above a couple of cubic feet the resonance starts to be in the bass range. A “surprisingly amount of engineering”? Ugh, there goes my OCD again. Upcycled is the worst new word. But does it sound tinny?